Unleash your creativity with these brightly colored stars and circles! Red, orange, yellow and white stars sparkle against a dark grey background (so dark it's almost black). 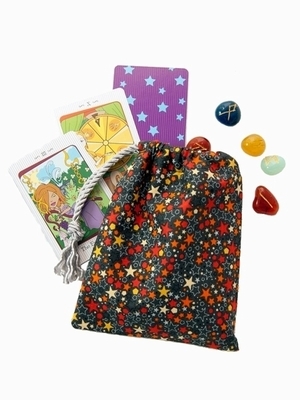 It makes a joyful place to house colorful and creative cards (like pocket tarot cards, trading cards, etc. ), a set of wooden or gemstone runes, gemstone collection, gaming dice... well, just about anything! Great for giving presents in too. Pictured: Creativity short bag with a platinum cord shown with cards from the Vanessa Tarot and a selection of runes from the 7 Chakra Rune Stones Set (cards and runes not included). Size: Measures approximately 5" wide by 6" inches tall (12.7 x 15.2 cm). Fits most rune sets and small card decks (2.75" x 4" and smaller).